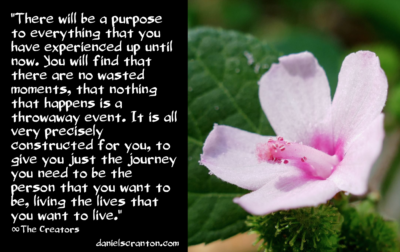 “There will be a purpose to everything that you have experienced up until now. You will find that there are no wasted moments, that nothing that happens is a throwaway event. It is all very precisely constructed for you, to give you just the journey you need to be the person that you want to be, living the lives that you want to live. You do not need to know or remember what everything that happens and has happened means. That is not your job. Your job is the experiencer of what is before you. Trying to figure it all out and make sense of your life will only keep you a bit longer in that particular place where you find yourself wondering. It is much more important and significant for your development, for your self-knowing experiment, that you accept everything as it is and realize that it is all serving you in some way. Every single thing serves you in some way. So relax and know that the path you are on is the path that you have set before you. You are the builder of the path and the walker on the path, and there is no reason or need for you to know where the path leads or why you went left instead of right. Begin to focus more on what you can do to have a more full experience of the path. Be curious about your environment, about where it is you find yourself, without trying to decipher the codes.